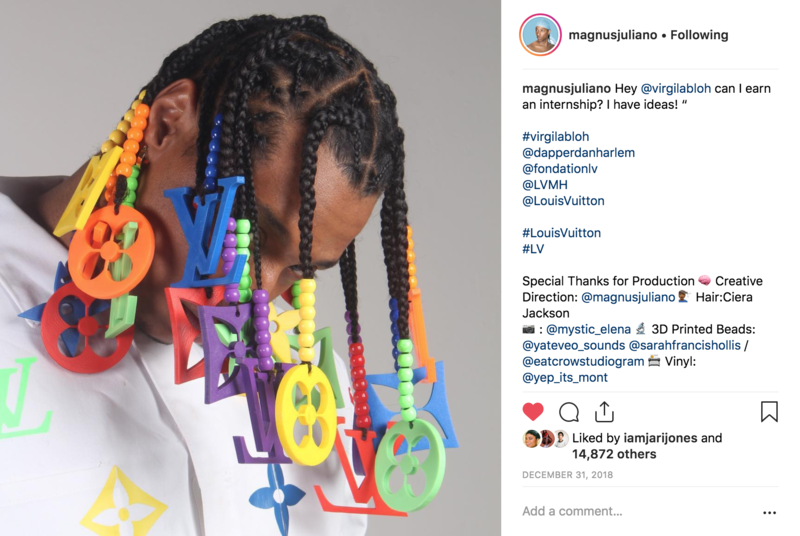 From Vogue to PaperMag, everyone seems to be talking about Magnus Juliano and his custom 3D Louis Vuitton beads. Who is this creative from Columbus, what inspires him, and where does he want to see fashion evolve? He tells us below. Q: BET says you broke the internet. What do you think? Magnus Juliano: You know what? I’m shocked too. I’m not on the outside looking in, I’m on the inside looking in and I just kinda like can’t believe this is happening. If I did break the internet I guess that’s a good thing, I guess especially because it’s for something positive and creative and that’s me. So if that’s my legacy right now, then yea. I guess I did. Q: The photoshoot took under two hours. The 3D beads took 6 months to make and perfect. But your brain was ticking for longer…anyone scrolling through your social can see you’ve been working. How long were you toying other ideas before you settled on executing on this larger concept? Magnus Juliano: Well some of my other ideas were less time consuming because of production. The legos, I just had to find a way to apply the pieces and make them wearable. Versus like starting from the ground up. I had never made anything with a 3D printer before. And I also never made a bead from scratch. I’d previously used materials. With this, there was a machine that produces material that makes it. So this took longer because there so many different design elements that were used that I never played with before. Like for the outfit, I never used vinyl so I had to create the outfit around vinyl and I’m like this is a new territory! Q: So you created the individual beads from scratch also? Magnus Juliano: I designed them and worked with Eat Crow Studio to produce them. This was new to them too. We had to go through trial and error and threw a bunch out. We had to make sure they were sized properly to make sure they fit and that the rubber band could fit around them. I wanted them to look extra and loud and dramatic so we had to make sure everything was right. 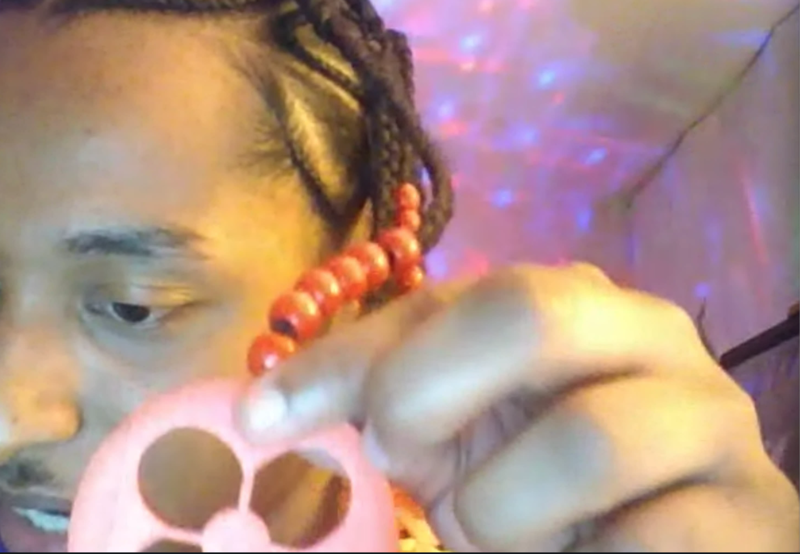 Q: Oh that’s crazy, I didn’t realize the beads where also 3D printed. Also you make 3D printing look easy (and good)–but custom 3D printing jobs aren’t exactly. The plastic can be somewhat fragile, and expensive. How many total LV pieces did you create and how many sets of each design? Magnus Juliano: There are 24 total with four different designs. I designed each one, and I had to think it out because if you look and pay attention to some of them, like this one [image below] you’ll see how this shape now has lines that meet in the middle, but I had to do that in order for everything to hold together. Q: And what made you decide on those colors? 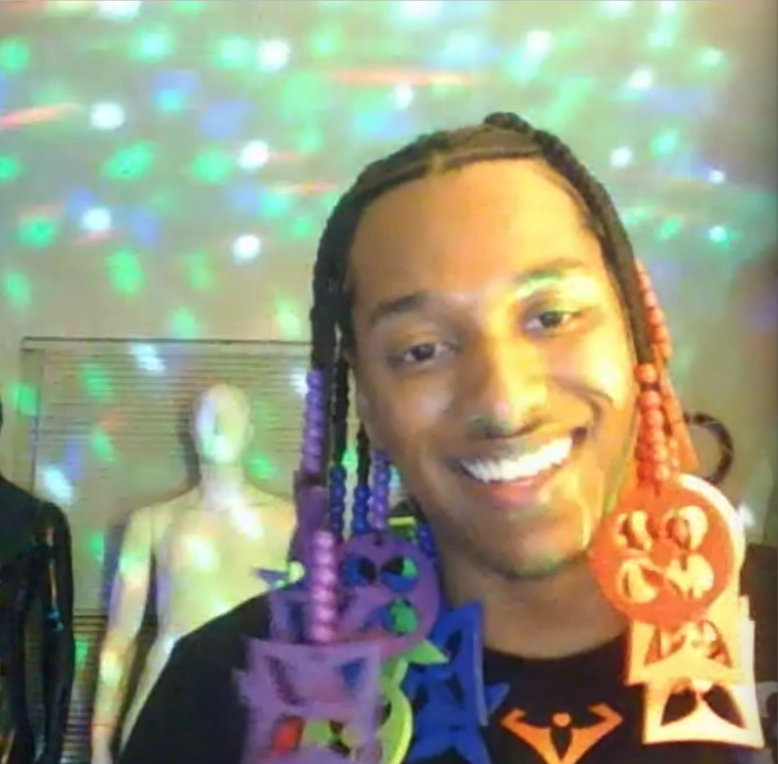 Magnus Juliano: You know I really just wanted to do something that was standard red through purple and of course those colors correlate with our community. I just love a rainbow. I think a rainbow is bright and happy and I felt like last year when we were working on the project it was such a dark year and time–I really forced myself to wear colors to boost my mood a bit. I think that people react to bright colors just as much as I do. Q: You’ve been working for a while with beads, creating looks for Afropunk, Bone Thugs-N-Harmony, and Kelela shows. 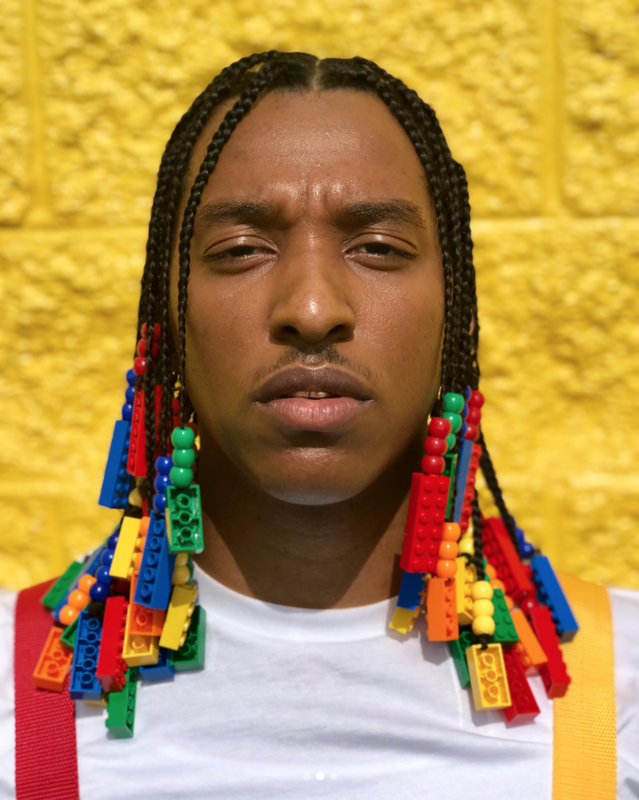 You’ve even creating a Lego-inspired look. What makes you decide to go for a look, and where does your inspiration come from? Magnus Juliano: My inspiration varies. 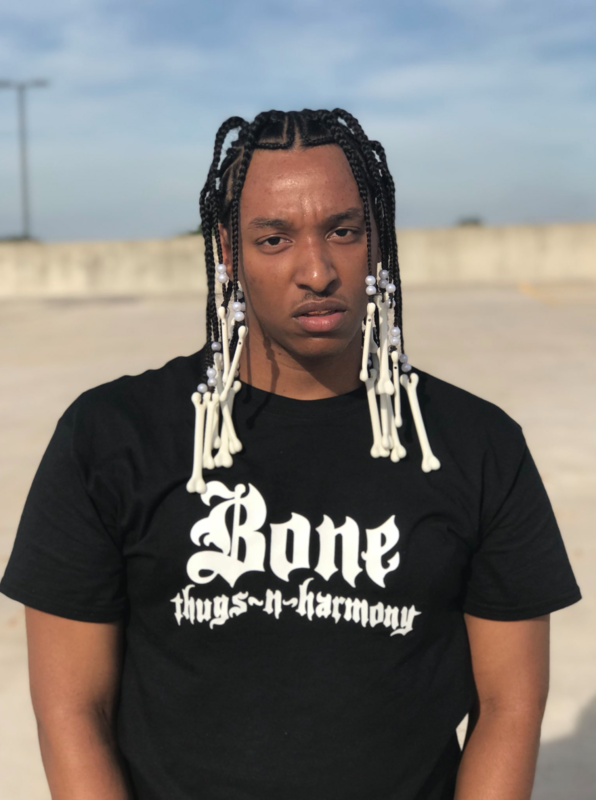 For Bone Thugs-N-Harmony, I really wanted to go see them and pay homage to them. They are from Ohio. Me also being a music artist from Ohio just felt like a connection to their music. It was my way to artistically express my love for them in my own personal way. Yes I could’ve worn a shirt, yes I could’ve worn my fro out the way they have in the past but I wanted to do something a little more original. But when it comes to my designs it’s not like I’m like, “oh I love legos this week!” For the legos thing, yes I loved them as a kid…I had an infatuation with building things up. I loved that I could stack them and shape them and sculpt them. So I’m thinking, well I can add these to my hair and I can sculpt my hair. So there is a functional aspect to some of the designs just as well as there is a playful aspect. Q: You must’ve been the star of that Bone Thugs show. Magnus Juliano: A lot of people reacted to it and it felt really good. It was just my way of expressing the love. I love them so much. But you know really, because I’m in Columbus and it’s a pretty mundane, kinda conservative city so I think people respected it for like, concert wear, but I don’t know if they were excited about it. It was more so like my internet community and friends that were excited about it and thought it was cool. Q: For this concept, when did you get the idea to @Virgil? Magnus Juliano: While I was creating the concept when we were still going through like trial and error and I had ever more ideas, I thought to myself, I could see me actually sitting in Louis Vuitton next to these people and creating. Because there is this weird infatuation that I have with accessorizing with hair or clothing in general. The ideas just kept rolling in and I just thought wow I wonder how he would react if I asked for an internship, if he would react at all? It wouldn’t make a difference at all for me because this is still a passion project…but I could really see me doing this. This is probably something I’m supposed to be doing. This is where I belong. Q: You mentioned in your Refinery29 interview that you’d like to see “Virgil Abloh experiment with men’s silhouettes, exploring the male physique more — besides the standard jeans and T-shirt — while at Vuitton.” Can you go into that a bit more? Magnus Juliano: As designers and artists we all have responsibilities to push things forward. I would like to see the silhouette open up on a man. A man in more flowy pieces. A man in more constructed pieces. There’s so much there that we don’t explore. Don’t get me wrong, stay with some of the tradition but let’s push culture forward because that is our responsibility. I’m not judging because I’ve never been in a room with him, but I feel that way about a lot of designers, like can we start pushing more things? There are uncommon designers in these legendary seats, that have already changed the world, which he’s proven time and time again, but let’s go all out. Q: Along that…if you turn to Virgil Abloh and Dapper Dan for “street couture” inspiration…which designers do you currently lean on for inspiration that do challenge traditional gender narratives? Magnus Juliano: I look to the community. Because I feel like we push it. There are brands like Gypsy Sport that are prominent, very needed and necessary. I’m black and I’m from poverty and I’m queer. So with that said, I’m at this intersection where street culture means a whole whole lot to me. I grew up around from the quote-on-quote D-Boys and the around the way girls. And so the reason I put so much emphasis on street culture it really determines other cultures and popularity and what we see, hear, taste, feel. It is embodiment of the world. It starts in the streets. It’s why I’m particularly focused on and I look to street designers who have a great influence [like Virgil]. Because once again we are only a subculture so I can push this agenda out for me to be queer and urge for different silhouettes, like how we were talking, and things of that nature. But if you have someone that’s already pushed so much into a heteronormative society, that can start to break down those boundaries and it’s going to mean more. Q: Yes yes. When did you make your “Stop Racism Against Black People” shirt? What prompted you to create it? Magnus Juliano: The message says more than what I could say. I didn’t want to just sell cool shirts with a loud or more direct message. I wanted to sell hope. I wanted to give people something to say by wearing it. Because sometimes people don’t want to hear what you have to say, they just listen to respond–they don’t really care. So I just wanted to make a message you can wear and sell that type of hope. I wasn’t looking for a huge come-up, it was just about the love, and love for black folk. Q: I get that. Speaking of…you met Angela Davis! What was that like? Magnus Juliano: Yes!!! Icon. Oh my gosh I met her at the Women’s March. It was amazing to just tell her what she meant to me and how much I appreciate her and everything she’s contributed to my freedom and to my identity and my rights. She’s so incomparable and I literally stan Angela Davis. She’s an OG and she’s ever-changing. You can tell she’s challenging herself to understand, to liberate, to educate. Even to be in her presence was iconic. I really think we need to give her more flowers while she’s here. Q: How do you think we can use fashion to help educate previous generations? Magnus Juliano: Fashion is a true testament for where we’ve been and where we’re going. So I think from the fabrics, to the messages on the clothings, to the designers, to the models to the runway all the way through retail. Fashion can be easily taught from generation to generation. I just think it’s important we communicate the versions everyone should hear versus the one’s we’re being told. Q: What’s your opinion on websites that feature only brands created by people of color, women and the LGBTQ community? Magnus Juliano: We need platforms that uplift people that feel oppressed. We need platforms that get our voices heard. As you said, it creates opportunity for us, us as a collective it will get us heard and even more and louder. To me it means a lot because that’s been my struggle through life. I’ve always feared for women, I’ve always feared for my community, I’ve always feared for disabled people. Those voices need to be heard now, they need to be protected. Any space dedicated towards them is a beautiful thing. Q: You are doing it, can’t wait to see more from you. Thank you for sharing your time, discussing your creative process and thoughts on how you think the industry should evolve. Is there anything else you’d like to share? Magnus: Black lives matter. Stop killing black trans women. Protect black kids. Give black people space. Drop your email on the line to get the origin stories of brands run by women, people of color and LGBTQ individuals.